This post is the second in my series on Race in Larp. It builds on my first post, which sets out some of the dilemmas around race for game designers. To quickly recap, in my last post I raised the point that all narratives are born into a larger cultural context that we don’t get to choose. And so, even if your larp isn’t dealing with race as a direct topic of the storyline, how you design it necessarily takes a slant toward race, just as say, it takes an angle on gender, or assumes certain things about social class. You can’t get out of dealing with race in your scenario–the only thing you can do is make a conscious choice about how you are dealing with it. So, since we’re all making choices about race in games all the time, I’d like to set out a by-no-means exhaustive list of things a larp designer should consider and think-through before creating a game. I’ve assembled this list after attending panels and talking with gamers of color on my own local scene, as well as from some great posts I’ve listed at the bottom of this entry. The less diverse the narratives told about a group, the more important it is to treat those stories with extra tender care. If the media only presents Koreans as super-smart computer programmers, then maybe aim a little higher and present a fuller range of experience. When you tell a story, you become part of the cultural narrative, and you can choose to reinforce the stereotype or undermine it. I’d suggest undermining it. Are the characters of color being used as props for a white person’s story? Does the larp use them as props to give white people epiphanies? Sure, in any narrative not all characters are equally fleshed out–some are three dimensional and some are two-dimensional, but on the few occasions when people of color are represented in a narrative, they are often relegated to supporting cast. Does the portrayal of characters from other culture treat them as individuals rather than members of a large group that is assumed to be monolithic? In other words, don’t make a larp about “Native Americans,” as that groups them into a single whole, rather than acknowledging that there are 566 federally recognized tribal governments with their own distinct cultures. Respect the variety and individuality of groups that have been traditionally marginalized. If you think all Native Americans are the same, then that probably means you haven’t bothered to do the most cursory level of research. Characters with unspecified traits usually default to the dominant class. Give out a character named “Bill” and it’s likely players will assume he’s a straight white dude unless the character sheet says otherwise. Sometimes this isn’t a problem–it can be complicated for white people to play people of color even in a game without skewing toward racist portrayals. But it also confines the narrative to stories about white people, and that white-washes reality in its own particular way. Make characters of different nationalities, but don’t make that element a big deal in the narrative. This communicates that diversity is normal. Make characters of different nationalities and focus the narrative on the experience of that difference. This can give players a little empathetic look at what it means to deal with racial discrimination. But it only works if you give players the tools to reach beyond stereotype. Make characters ambiguous but leave room for players to choose to play characters of different races rather than forcing a white narrative on them. This is a nice way to be inclusive of players from a variety of backgrounds. If you give me the name Alan, I might assume I’m white. If you give me the letter A and let me make up my character name, I could choose to play Amruta. Have the organizers done research to understand the specific situation of this group? If I’m going to write a short story about larp, I damn well better have talked to some larpers. If you’re going to write a larp about Indian immigrants to the US, at least read up on that online. Even better: talk to some Indian immigrants to the US about their experiences. Do you understand the cultural context of what you’re doing? Have organizers communicated this research to the players? Background research does you no good if you don’t communicate your knowledge to the players. We all have prejudices that may be invisible to us. Help me overcome mine by giving me nuance about the experience of others so that I don’t play this character super-offensively. Treat sacred cultural elements with respect. If I put on a military hat to go to a larp and someone tells me that actually, it’s the hat used by WWII veterans who have earned a purple heart and it carries some of that significance, I might think twice about wearing it because I don’t want to pollute its symbolic value. Do the research to know which cultural elements may be sacred. Think four or five times before you take something that is considered sacred and put it in your game. If you are borrowing something sacred, at least try to treat it with respect. Think about how irritated you get when a journalist misuses the word “larp” or “boffer.” Now imagine that someone is doing that with something ten times more important to your self identity. Would you feel comfortable showing a cultural portrayal to someone from the culture in question? If not, that’s a good sign that you should probably go back to the drawing board. Work with the culture(s) in question if at all possible. Dominant cultures have a tradition of silencing non-dominant cultures, not just by refusing to tell their stories, but also on a structural level, by denying opportunities to people of color to tell their own stories. If you can, encourage members of marginalized groups to tell their own stories–ask them to be part of your organizing committee and listen to them. At a minimum, try to talk with them as part of your due diligence to ensure that you are not simply pillaging cultural artifacts without providing a respectful context. Also: having more people of color as players, organizers and writers is good for the community. Do what you can to recruit them and make them feel welcome. Welcome critique and criticism. Culture, including larp, doesn’t happen in a vacuum. Put “native-style” headdresses on white fashion models, and regardless of your intention you are invoking the historical context of how native peoples have been treated, which includes having their cultural pillaged for its prettiest most “meaningful” artifacts while the people themselves have been dismissed and ignored. Strive to know the cultural context around what you are taking. Intent isn’t magic. I might not have intended to rear-end your car, but now your bumper has a dent in it. Despite good intent, mistakes happen, and while good intent makes an apology better-received, it doesn’t undo the injury. If you make a mistake, strive to understand it, issue a sincere apology, and move on. It’s likely that you’ll make mistakes, but unfortunately, this is one of the main ways to learn. Take risks, fail, and learn. You won’t get it perfect, and neither will everyone else. Strive for a play culture in which it’s OK to make mistakes and learn for them. If we can’t talk about this stuff, we’ll never get better at it. Dominant cultures are used to taking what they want from other cultures. If you are a member of a dominant culture, this can be invisible to you at times–I know I can be oblivious to this. Make some effort to interrogate yourself on this. Do not raise up that which you cannot put down. In other words: don’t let your larp raise questions it is not prepared to answer if you can possibly avoid it. If the game is not prepared to handle racist stereotypes, do not introduce them into your game. If your game is not set up to handle the aftermath of say, a white person showing up in a stereotypical Native American outfit–if the game itself is not about addressing the complexities and hurt around racial masquerade, then leave that off the table. Of course, in the US, at least, speech is free. These rules do not constrain what it is possible for you to say. By law you’re entitled to say what you want, but the rest of us are also entitled to judge you by your speech, and your speech has context that you can’t choose. Did I miss some stuff that’s good to think about? Of course I did! Can any one reductive checklist possibly make a larp non-racist? Of course not! Post more suggestions, comments, and commentary below. Like this post? What to read more like it? Become the Apollo to my Orpheus and Patreonize me! This entry was posted in Blog, Features, Larp and tagged cultural appropriation, cultural appropriation in larp, Larp, race in larp, social justice in gaming by Lizzie Stark. Bookmark the permalink. In fairness to game of thrones, Dany is not of any real ethnicity – she has platinum hair, violet/purple eyes (or would have if the actress was able to wear contacts) and racial powers to semi-control dragons. She’s also Dornish on her mother’s side if I recall correctly (which I guess explains her not-targaryen dark haired eyebrows). Most of this article is actually about culture, not race. 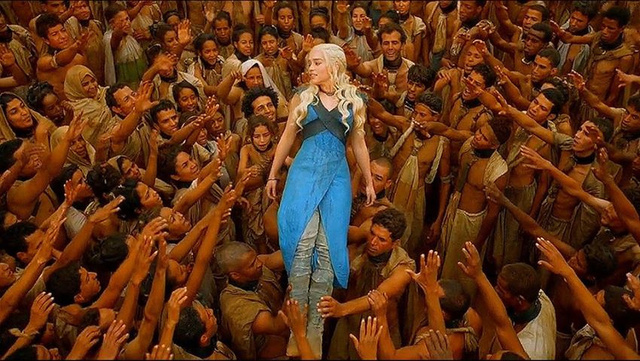 Whether or not Dany has a real-life ethnicity in the book, on film she is a white actress filmed using a sea of people of color (or are they just tanned white people?) as props. That’s racist. …most of this article is about “culture” because “culture” is what the thing that we call “race” is in the real world. “Race” doesn’t exist. I’m just going to assume that you understand this. Culture is not the same thing as race. Race, as a term of physical appearance, does exist, and many people stereotype and misjudge and oppress based on the physical aspects of others, like the color of their skin. I would like to encourage other larp designers to explore other cultures for their larps, despite the warnings and dangers of offense. I’d like to see more larps inspired by cultures and peoples beyond medieval Europe. Not replacing those larps, but creating them in addition to. The world is large and history is long, and I think larpers can and should be able to use any aspect of human history as a basis for their art–especially if they treat every asset with respect, as Lizzie suggests. Another profound article, Lizzie, thank you. Good articles, Lizzie. Personally, I find it more interesting to replicate and highlight racist patterns when addressing race in games. Or at least that’s what I see when I look back at what I’ve done through the years. She’s not using them as props. She has just freed them from life long slavery (by people of the same ethnic background as them, incidently), and they are spontaneously showing their love for their savior, to whom they are giving the title ‘mother’ in their language. To be even more precise, her arrival was the catalyst that caused the slaves to rise up and free themselves – she couldn’t take the city without that happening – so those ‘props’ in fact have just displayed their own agency in winning their freedom. It simply took her arrival to destablise the region, to give the masses the catalyst to rise up. I can see why you are seeing that angle in that particular picture (which was was included to create a mirror of Jon Snow being carried into Castle Black, referencing the ‘ice and fire’ theme/title by the pairing), but it feels like you are taking this one scene out of the wider narrative context. By this logic, one could point to the scene of Karl Drogo using Dany as a sexual prop, and claim that is racist against white people. The next season will include a lot more non-white Protagonists (as shown in the trailers) when the Dornish start to play the game of thrones (and certain other characters visit the lands outside Westeros). Yes, the great white savior trope, where a white person sweeps in and saves the day for people of color. That’s a classic. We’ve also got the double header with Kal Drogo: the men of color are oversexualized savages preying on white women trope, which was used with such awful consequences in the US. I like Game of Thrones too, but it has very problematic parts.